The fisherpersons of Sri Lanka and India have been fishing in the Gulf of Mannar, Palk Bay, Palk Strait (the latter two together are also commonly known as the Sethusamudram), and elsewhere harmoniously from time immemorial using traditional equipment and methods of fishing. However, due to technological advancements (modern fishing vessels including multi-day boats and trawlers, modern fishing nets, etc. ), the marine resources on the Indian side of the Palk Bay and elsewhere have been aggressively harvested and overexploited. The fisherpersons of northern Sri Lanka have not been able to avail of such technological advancements owing to the onset of the civil war in 1983 and the resultant severity of restrictions imposed on fishing by the security forces of Sri Lanka. Therefore, due to the relatively greater stock of marine resources on the Sri Lankan side of the Gulf of Mannar, Palk Bay, and Palk Strait, Indian fisherpersons have been poaching in Sri Lankan waters, and are involved in illegal and unfair practices such as ‘bottom trawling’ and ‘pair trawling’. A growing number of persons involved in such poaching appear to be waged fishing labourers (hired by trawler owners who are big businesspersons), and who do not belong to the traditional fishing communities in Tamil Nadu. Thus, the dispute of poaching in Palk Bay is NOT about the competing livelihoods of fisherpersons from northern Sri Lanka and Tamil Nadu, as is usually reported in the mass media in Tamil Nadu, but is about the illegal, unreported and unregulated (IUU) fishing, a universally banned activity, by trawler owners and fisherpersons from Tamil Nadu instead. The objectives of this policy paper are to first, make an informed assessment of the magnitude of these fishing disputes that occur between Sri Lanka and India in terms of both monetary and livelihood losses incurred by the country (Sri Lanka), and the people who are directly affected by the same; and second, to explore scientific or technical solutions to this long-running dispute to counter the ineffectiveness of law enforcement and the presumed absence of political solutions. The foregoing objectives are fulfilled using existing data that has been drawn from other researchers, as well as from existing scientific knowledge. Secondary data and knowledge, targetted primarily at the policy communities both in Sri Lanka and India, form the base of this policy paper. The discussion is also targetted at the fishing communities involved in this dispute in order to sensitise them to the alternative dispute resolution mechanisms available, with specific focus on the scientific and technical solutions that are already available. According to the latest available data, in 2015, there were 48,380 active fisherpersons in the entire Northern Province accounting for 22 percent of the total fisherpersons in the country (i.e. 48,380 out of 221,560). The Jaffna district accounted for almost half of this total (23,480 or 49 percent) followed by Mannar district (with 17,540 or 36 percent). In total, 183,480 persons made up this community’s total household population in the Northern Province; of these households, 54 percent (98,230) were in the Jaffna district and 32 percent in the Mannar district (59,530). Over 50 percent of the total population of the Mannar district is a fisher household, which proportion is much lower in the Jaffna district, because its total district population is six times that of the Mannar district. In the aftermath of the civil war, the total ‘fish-catch’ in the Northern Province has doubled (increased by 116 percent) between 2010 (33,600 metric tons) and 2015 (72,560 metric tons). However, the total catch in the Northern Province has not yet recovered to the level of 1980 when 88,452 metric tons of fish were caught. In 1980, the Northern Province accounted for 47 percent of the total fish catch in the country, which had declined to just 16 percent by 2015.
l The fish catch in Mannar also declined by 17 percent between 2012 (13,450) and 2013 (11,110) and by another 12 percent between 2014 (22,130) and 2015 (19,390). 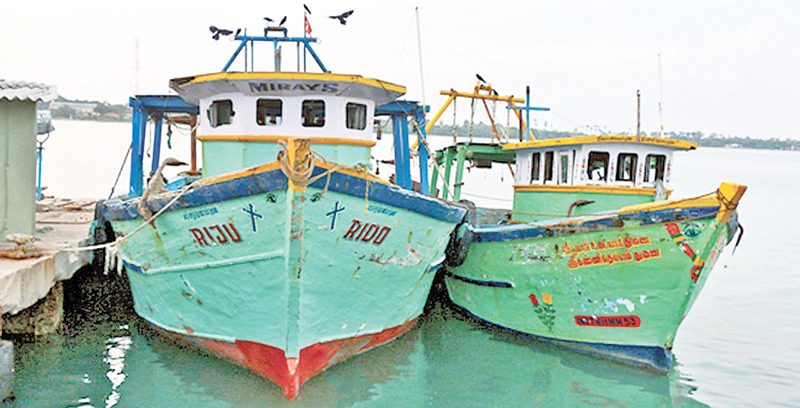 The plausible cause of this non-linear growth in fish catch in the Jaffna, Kilinochchi, and Mannar districts could be the increase in poaching by Indian trawlers. Such considerable fluctuations are an indication of the extra-territorial restrictions imposed on the fisherpersons and the fishing industry in the post-civil war Northern Province. The fishing sub-sector contributed only 1.7 percent to the national economy of Sri Lanka in 2010, which decreased to 1.4% in 2015. In contrast, the fishing sub-sector contributed 3.7 percent to the Northern Provincial economy in 2010, which significantly increased to 5.6 percent in 2015 (the latest year for which provincial GDP data is available). If not for poaching, the fishing sub-sector’s contribution to the Northern Provincial economy might have been even greater. The estimation of the economic and livelihood losses caused by poaching by Indian trawlers is difficult to calculate. The fish are not bound in any way by the maritime boundaries between different countries. Further, it is very difficult to physically count the number of trawlers crossing over into the territorial waters of Sri Lanka as these tend to vary from day to day, and information on the types of fish caught by the poachers is impossible to verify. Moreover, the retail and wholesale prices of different varieties of fish change constantly, thus making it impossible to impute values for different varieties of fish affected by poaching. In addition to today’s losses incurred due to poaching, the fishing by bottom trawling kills future streams of income due to mass killings of under-grown fish (‘by-catch’) as trawlers shovel the bottom of the seabed indiscriminately. It is claimed that about 75 percent of fish and residues (‘by catch’) caught by trawl nets are non-marketable. The trawlers also irreparably damage or destroy fishing nets used by fisherpersons in Sri Lanka, thereby causing the latter to avoid fishing on the days that Indian trawlers are expected to poach in Sri Lankan waters, consequently incurring a livelihood opportunity cost. In addition to the direct monetary losses incurred by the fishing communities in the Northern Province, there are indirect losses incurred by the entire supply chain of the fisheries sub-sector, ranging from processors of fresh fish (drying, canning, etc.) to wholesalers, retailers, and the exporters of fresh and value-added fish. There have been a few estimates of the economic value of poaching made by Dutch, Indian, and Sri Lankan fisheries experts and researchers in the last decade. These estimates are conjectural and indicative at best. Some of these guesstimates are relatively better than the others. According to this author, Oscar Amarasinghe has undertaken the most systematic loss estimation to-date using ‘scenario analyses’, and ‘sensitivity analyses’, over a three-year period (2006–2008). The estimates made by five different experts and researchers range from US$ 16 million (lowest) to US$ 56 million (highest) per annum. Interestingly, the foregoing two extreme guesstimates are by persons from Tamil Nadu. The in-between guesstimates are by Dutch and Sri Lankan researchers. The average of these five different estimates is US$ 41 million or LKR 5,293 million per annum. Accordingly, the annual direct monetary loss to each member of the fishing households in the Northern Province is LKR 28,848. This amount is derived by dividing the annual total direct losses due to poaching (LKR 5,293 million) by the population of the total number of fishing household population (183,480). Furthermore, the annual direct monetary loss due to poaching (LKR 5,293 million) was equivalent to 1.4 percent of the Northern Provincial Gross Domestic Product in 2015, which was LKR 390,689 million. The indirect losses in terms of value addition (processing, canning, drying, etc. ), wholesale and retail mark-ups, and losses in seafood exports due to poaching by Indian trawlers are estimated by this author to be 50 percent of the direct losses. Hence, the indirect losses amount to US$ 20.5 million or LKR 2,646.5 million. The annual direct and indirect losses incurred due to poaching by Indian trawlers (LKR 7,939.5 million or US$ 61.5 million) amounts to 2.0 percent of the provincial GDP of the Northern Province in 2015 (LKR 390,689 million). * The annual direct loss incurred by Sri Lanka due to poaching is LKR 5,293 million (US$ 40.5 million). * The annual direct loss is equivalent to 1.4 percent of the Northern Provincial GDP in 2015. * The annual direct as well as indirect loss is equivalent to 2.0 percent of the Northern Provincial GDP in 2015. A micro level study in selected coastal areas in the Mannar district has been undertaken during 2014–2015 towards an undergraduate dissertation in Sri Lanka, which reveals valuable insights on the impact of illegal fishing on local fishing communities. It is also important that Sri Lanka Navy personnel refrain from firing at Indian poachers in Sri Lankan waters, as has happened several times during the course of Sri Lanka’s long civil war, hence severely injuring, (if not killing,) such fisherpersons from Tamil Nadu. There have also been instances of fisherpersons from northern Sri Lanka and Tamil Nadu having violently clashed with each other closer to the coastlines of the Northern Province, resulting in at least one Sri Lankan Tamil fisherperson being killed. Given these circumstances, it is high time to explore scientific or technical dispute resolution mechanisms to resolve this long festering ‘soft-conflict’. According to media reports, some time ago, there was a proposal to erect electric fences along the maritime borders between India and Sri Lanka. However, this proposal was understandably rejected by the GoI because such an electric fence could be fatal to fisherpersons of both the countries who may trespass into each other’s maritime territory inadvertently, or in an emergency under distress. It is claimed that the biodiversity of the bottom living bio-foulers could be greatly increased by increasing the sea bottom substratum. Shinya Otake, a Marine Biologist at Fukui Prefectural University in Japan, claims that some of the artificial reefs built in Japanese waters support a biomass of fish that is 20 times greater than similarly sized natural reefs. A study undertaken at the Occidental College in Los Angeles confirmed the foregoing claim by revealing that the weight of fish supported by each square metre of sea floor by oil and gas rigs off the Californian coast was 27 times more than that supported by each square metre of sea floor by the natural rocky reefs. The deployment of a three-dimensional artificial reef with dimensions 10 feet by 10 feet by 1 foot in the sea bottom will increase the surface area by 23 times as the bottom substratum increases to 230 square feet. An artificial reef of the size of these foregoing dimensions will cost about INR 2.5 million (US$ 38,610 or around LKR 5.4 million) and will last for a minimum period of 25 years. Such artificial reefs are most suited for deployment in shallow waters as is the case of Gulf of Mannar, Palk Bay, and Palk Strait. In addition to increasing the marine fishery resources, artificial reefs are an effective deterrent against bottom trawling by trawler boats. The trawlers would not operate in areas with artificial reefs as it would result in severe damage to the trawl nets, and possibly the trawler boats itself. Therefore, the fishing communities in northern Sri Lanka as well as the fisheries authorities should seriously and expeditiously consider the construction and deployment of artificial reefs in the Gulf of Mannar, Palk Bay, and Palk Strait, first, in order to deter the trawlers from Tamil Nadu illegally poaching in Sri Lankan waters, and second, to increase the stock of fish. These artificial reefs could save the fishing community from dithering law enforcement agencies, inordinate delays of the legal processes, and parochial political haranguing. This scientific and technological approach could potentially result in a win-win outcome (non-zero sum game as per the game theory), for the fishing communities of northern Sri Lanka and indeed the entire supply chain of the fishing sub-sector in Sri Lanka.